Floyd Dixon was brought together with two other legendary piano players and a top-notch backing band for two special nights of music at Phoenix's Rhythm Room. 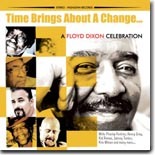 The release of Time Brings About a Change…A Floyd Dixon Celebration is bittersweet considering Dixon's recent passing, but what a wonderful way to commemorate his life! The CD release is this month's Pick Hit. Michael Powers follows his debut disc with an even better sophomore relese in Prodigal Son, our Surprise hit for the month. Classic soul recordings from Spencer Wiggins, The Goldwax Years, highlight this month's Flashback section. This month's What's New section features new releases from Guitar Shorty, Robert Randolph, Glamourpuss, Jerry Lee Lewis, Jackie Payne / Steve Edmondson Band, Betty Padgett, Al Basile, and Sterling Williams, as well as a previously-unreleased live recording from Ray Charles.